Searching for the best high-calorie healthy foods for your diet? You’ve come to the right place! Read on to discover the most nutritious choices. Now here's a dish! 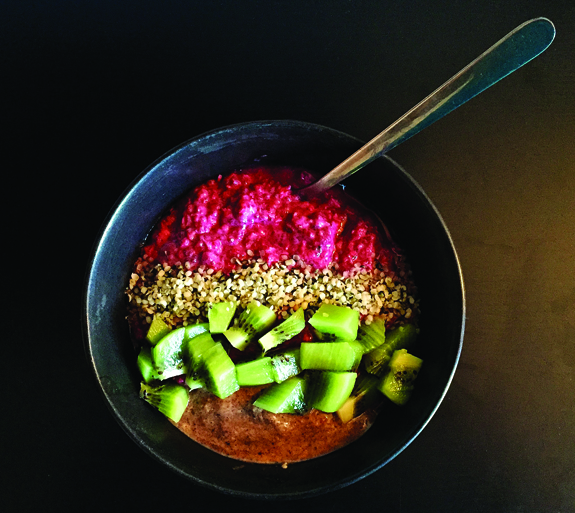 All together in this bowl: chia seeds, kiwi fruit, raspberries, and hazelnut butter mixed with almond milk—a tasty treat of healthy high-calorie foods. Not all healthy foods are created equal. Many are high in calories, which can be a good thing if you’re one of those people who needs to gain a few extra pounds. 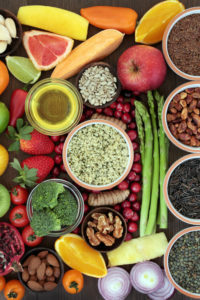 If you have been advised by your health professional to gain weight for medical reasons, choose clean, you’ll want high-calorie healthy foods from nature—whole foods—that are nutrient-dense. Avoid junk foods that are high in carbohydrates and sugar—these essentially provide “empty” calories. Remember that food is fuel. The caloric value of a food correlates with the amount of energy it can provide. For example, for good energy supply, you wouldn’t eat a plate of lettuce alone, as it is low in calories (15 calories in 100 grams). We need to fill up with foods that offer the energy and nutrients that our body requires. Remember that it’s not just about the quality of our food choices; it’s also about quantity. The FDA warns that consuming too many calories per day is linked to obesity and being overweight. According to the Institute of Medicine, the estimated amounts of calories needed to maintain energy balance is dependent upon gender, age, and physical activity level. The following high-quality, high-calorie healthy foods make excellent choices for energy and weight gain, if medically required. Ask your health provider about how many calories you should be consuming daily. Also, make sure your meals and snacks are well balanced with respect to the macronutrients (protein, fat, carbohydrate). In other words, the foods listed below are not recommended to be consumed as a complete meal on their own, but rather as part of one. 1. Fill up on fresh fruits. For a calorie fill-up with fruits, good choices include avocados and mangos. Packed with nutrients, avocados are actually 75 percent (healthy) fat and can offer more than 300 calories each, depending on their size. Make mango and avocado salads, and delicious guacamole dips. 2. Dive into dried fruits. Fresh fruits are better than dried ones; however, variety is the spice of life. When you reach for dried fruits, make sure there is no added sugar to keep it real. Generally speaking, one cup of mixed dried fruits can provide you with over 300 calories. Some choices are better than others. For example, research has shown raisins may be a good choice for those with blood sugar dysfunction or type 2 diabetes. People with diabetes should aim for fruit servings that contain 15 grams of carbohydrates or less. Approximately 2 tablespoons of raisins seems to be a good serving size and offers a little more than 100 calories. Dates are a sweeter choice, providing 23 calories each. Good serving size: two or three. Add small amounts of dried fruits to your favorite trail mixes or as toppings on unsweetened yogurt. 3. March with vegetables high in starch. Starchy vegetables are an excellent source of fiber and other nutrients: They contain more calories than other varieties. Give sweet potatoes, squash, and root vegetables a try. A medium baked potato offers 159 calories and one cup of sweet peas contains nearly 120 calories. Plantains are another option; they contain 122 calories per half-cup. Enjoy your favorite starchy vegetables roasted, sautéed, steamed and stir-fried (see “Get Extra Calories from Healthy Oils” section, below). 4. Go nuts for nuts and nut butters. Nuts and seeds are a good source of healthy fats, protein, vitamins, minerals, antioxidants and fiber. They’re high in calories, though they also help you to feel full and satisfied for hours. Research has shown that a 1.5-ounce serving (a small handful) of nuts per day, coupled with a diet that’s low in saturated fat, may help reduce the risk of heart disease. A serving of 2 ounces of raw mixed nuts contains about 160 calories. Enjoy nuts in homemade trail mixes (include oats, dried fruits, nuts, and other favorite additions), cereals, and granola bars. Or make your own hazelnut butter! 5. Embrace the power of super seeds. Like nuts, seeds also offer healthy fats, protein, fiber, antioxidants, and other nutrients. Consider adding chia, hemp hearts, and sesame seeds to your diet. Sprinkle them on just about anything! Tahini, made with sesame seeds, offers 89 calories per tablespoon. Chia seeds boast 70 calories per tablespoon. Flax meal has 30 calories per tablespoon, as well as fiber and healthy omega-3 fatty acids. I like adding organic sprouted flax meal to cereals and soups. 6. Get extra calories from healthy oils. Packed with heart-healthy fats and antioxidants, just one tablespoon of extra virgin olive oil will give you a whopping 120 calories. This healthy oil can even help you with nutrient absorption. \\I recently discovered cold pressed camelina oil; it contains roughly the same amount of calories as olive oil. This ancient oilseed is a worthy source of omega-3 and vitamin E, and has a high smoke point (475 degrees F). Use these oils in dressings and dips, and to roast and fry. 7. Give grains a chance. I typically avoid grains due to having celiac disease, as well as their negative impact on blood sugar. However, I will occasionally consume small amounts of pseudo-grains (with foods high in protein and fiber) such as quinoa for variety. A complete protein, quinoa is still considered a superfood and boasts an impressive nutritional profile while delivering more than 200 calories per cup. I enjoy quinoa as I would eat oatmeal—with raisins and cinnamon. As mentioned above, you can add another 100 calories to your cooked quinoa with 2 tablespoons of raisins. 8. Smoothies pack caloric punch. You can drink your calories too. High-calorie healthy foods can be blended into delicious drinks. Depending on your ingredient choices, smoothies can provide you with 300 to 500 calories per cup. Combine your favorite berries, nuts, and seeds into a mouthwatering smoothie. Add organic, unsweetened probiotic yogurt if you can tolerate dairy. The peanut butter maca energy smoothie featured in this post is a good example. 2 diabetes, add, antioxidants, blood sugar, calories, celiac, celiac disease, complete protein, dairy, dates, diabetes, diet, ed, empty calories, fiber, food, health, healthy fats, heart disease, heart healthy, high calorie healthy foods, institute of medicine, maca, nutrients, nuts, obesity, omega 3, omega 3 fatty acids, organic, people with diabetes, physical activity, potatoes, protein, quinoa, risk of heart disease, serving size, smoothie, sugar, type 2 diabetes, vegetables, vitamin, vitamin e, vitamins, vitamins minerals, weight gain, yogurt.